State Supreme Court pulls three-state ballot measure. 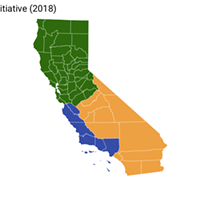 Well, it looks like voters won't get to decide whether California should be severed into three separate states — at least not this year. The California Supreme Court ruled today, according to multiple news reports, to remove the measure that the California Secretary of State's Office had already approved for the November ballot. According to the Los Angeles Times, the court's brief order indicates it took action "because significant questions have been raised regarding the proposition's validity and because we conclude that the potential harm in permitting the measure to remain on the ballot outweighs the potential harm in delaying the proposition to a future election." Meanwhile, another lawsuit contending that the proposition seeks to revise the state Constitution, and thus could only be placed on the ballot by a two-thirds vote of both the state Senate and Assembly, is also set to be heard by the court at a future date.